A very good visual and descriptive basic reference of things used in the early 20th century. With More than 1800 engravings, simple diagrams to detail cross-sections of the assorted devices. To illustrate the workings of each item, from simple hooks to the machinery used in and by Steam, motive, hydraulic, air, electric power, navigation, gearing, mining, construction and more. There are over 55 pages of Steam Power related items, from the “Dion Vehicle Boiler” to Assorted vibrating piston engines to square piston engines, to a large and varied number of governor types. 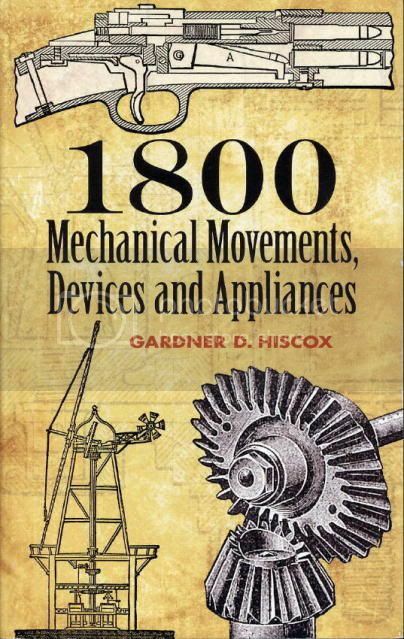 Followed by another Steam Appliances section of 10 pages, from the “Sellers, Self Adjusting Injector” to “ Misch’s Valve Tappet for steam pumps”. They is some items of interest for machinist, blacksmith. Assorted means of motion transfer, and “Blacksmiths helper to the “Revolving Rapid Blow Hammer”. And yes from the drawing it is the death trap that it sounds. Think of two large hammers on the rim of a spinning wheel! From Ag, RR, and Gun Smithing, to Horological items of interest. It covers something of interest to most that delve into the arcane arts. In this throw away digital world. With the illustrations and cross section drawing, and sometimes short descriptions. It will give a starting point for people that are looking to find out something about all that stuff Granpa had in the shed! I have added the section Titles to this review as there was a question if this was the same as the 507 /Henry Brown book. It is not.